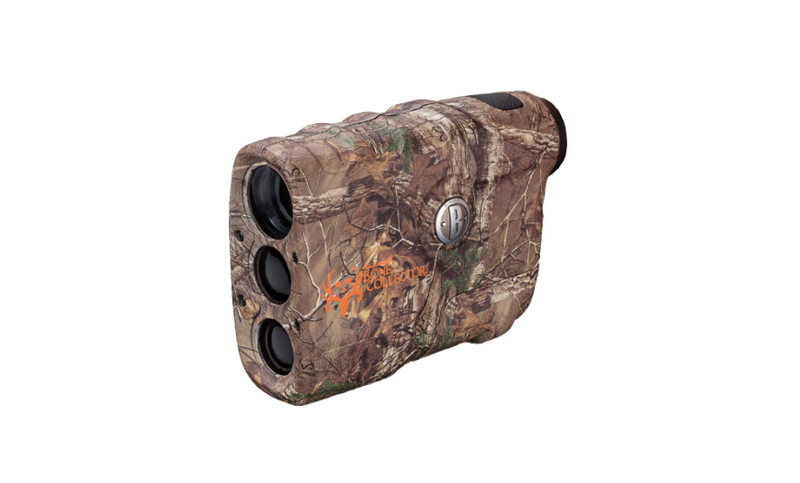 It only takes one look to see that the Bushnell Michael Waddell Bone Collector Edition 4x 21mm Laser Rangefinder is geared towards hunting enthusiasts. Everything about it is designed to appeal to those who love spending time out in the wild, whether they are gun or bow hunters. The price tag is a bit higher than your typical entry level laser rangefinder though, so let’s take a look and see if all the extra money will be well spent on the branding for the man from Booger Bottom. The Bushnell MWBCE looks like an impressive piece of equipment from a distance, so I was expecting it to be weighty, but holding it in my hands revealed that it is surprisingly light. It weighs in at less than 10 ounces which means it won’t slow you down or become a nuisance out in the wild. Some of the lighter rangefinders can feel like plastic toys, but the Bushnell MWBCE manages to feel very sturdy and durable despite its weight. It is also very compact and can easily be tucked into a shirt pocked when not in use which is always a bonus. Rangefinders with all kinds of flashy colors might look impressive, but are not always the most practical choice unless used exclusively on the golf course. The Bushnell MWBCE means business with its Realtree Xtra camo pattern which is designed to blend in perfect with different types of habitats. The housing of the rangefinder not only looks and feels rugged, but is also rainproof, so it can still be operated in wet conditions. This doesn’t mean that you can get it fully submerged in water and still expect it to work though. 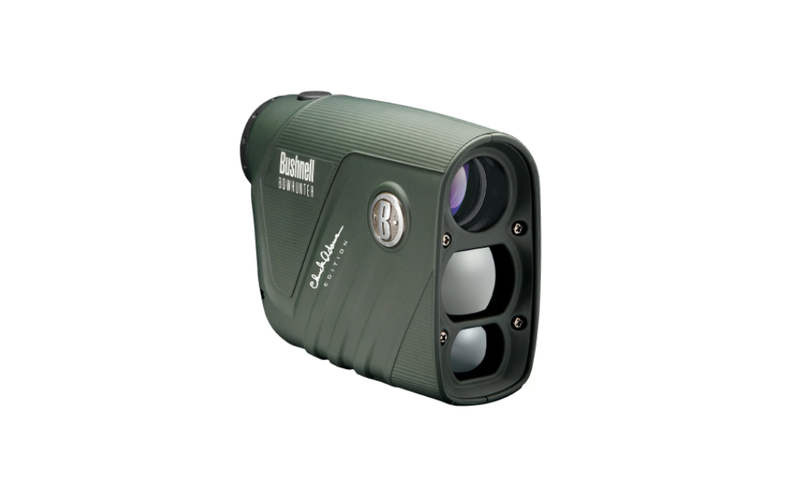 Like most laser rangefinders this one is designed with a vertical configuration that allows for easy, one-handed operation. The Bushnell MWBCE is very straightforward to use and to measure the distance to your target you only need to tap a single button. The button is conveniently located under your index finger when holding the rangefinder. This rangefinder operates using a single 9-volt battery, which can be a bit tricky to swap out when out in the field. It requires you to rotate a screw counter clockwise and then lifting the battery door before removing the battery and inserting a new one. The battery fits quite snugly in the compartment which means it won’t fall out (a definitely plus in the dark!) but requires some effort to remove. The Bushnell MWBCE boasts a range of 10 to 600 yards and is accurate to +/- one yard. Obviously the 600 yard range is reserved for large or reflective objects, so for everything else you are looking at closer to 400 yards maximum. For something the size of a deer you will be able to get accurate readings up to about 200 yards. It also packs crystal clear, bright optics which allows it to be used even in low light conditions. 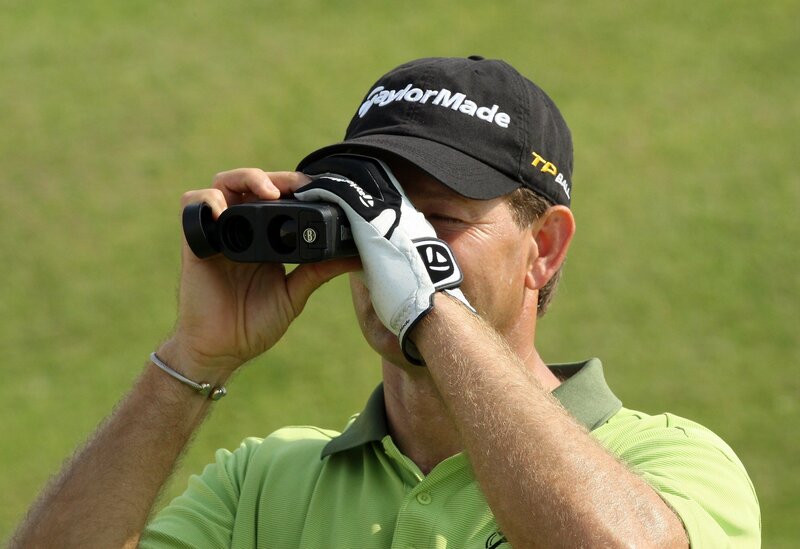 As with most quality rangefinders you can select whether you want to measure the distance in meters or yards. Instead of pressing a button to toggle between the units however the rangefinder must be off to make the change which can be a bit of a nuisance. The optics of this rangefinder is quite good and it packs a 20mm objective lens which features 4 X magnification. I love that the LCD on this rangefinder uses illuminated indicators which makes it easier to read in low light conditions. On the display you will see the battery life indicator, unit of measure and targeting reticule. The LCD remains on and displaying the last measured distance for about thirty seconds. The LCD display is very clear although I did notice a couple of black spots. According to Bushnell these are unavoidable and cannot be fully eliminated, but does not influence the performance of the unit. Also included in the package is a handy carrying case, but thanks to the small size of the unit you can just carry it around in your pocket for easier access. 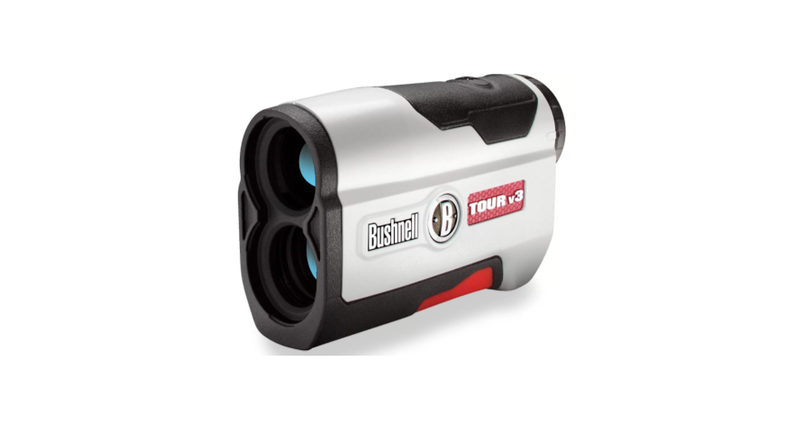 As to be expected from the Bushnell brand there is very little not to like about this rangefinder. It might not have any fancy features, but when it comes to measuring distance it does so quickly and accurately which is all that matters. This is not a rangefinder that you can use to show off a bunch of features, but when it comes to measuring distance it can’t be beat. Bushnell is a trusted brand when it comes to equipment such as rangefinders, so you can’t really go wrong with the Bushnell MWBCE. Michael Waddell is a well-known name amongst hunting circles, but whether it is worth paying extra to have it on your rangefinder depends on how much of a fan you are of him. The Bushnell MWBCE is definitely lacking some of the features on top tier rangefinder models, but for the price you cannot really argue. This is definitely a rangefinder that will appeal to anyone that don’t’ want to spend too much time messing around with settings as it is extremely user friendly. I’ve been a bushnell fan for a long time but after my bone collector rangefinder stopped working after 9 months That was it never again the LRF couldn’t take yardage so i figure i sent it back to bushnell for repair they gave me a hard time and tried to sell me another for a $127.00 at discount price lol no way i went with luepold and everything is working out good.